Beatle Collectibles, Records, Memorabilia, Toys, Albums, Singles, 45s, LPs, EPs is our specialty at www.Beatles4me.com. We offer a large array of Super Rare Beatle Collectibles, Records, Memorabilia, Toys, Albums, Singles, 45s, LPs, EPs for sale on our Beatle website, the "Largest Inventory" on the East Coast! We Buy & Sell Original Beatle Collectibles, Beatle Autographs, Beatle Records and Beatle Memorabilia. 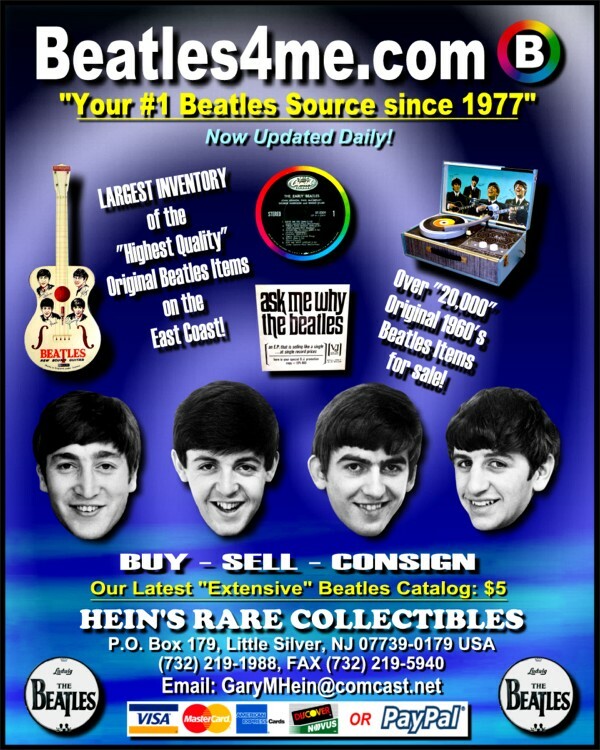 "Your #1 Beatle Source since 1977"
All items offered here are 100% Guaranteed Authentic. www.Beatles4me.com is your "Safe Beatle website!" Click here to begin your "Magical Mystery Tour" of our "Extensive" Beatle website! Remember, Beatle Collectibles, Records, Memorabilia, Toys, Albums, Singles, 45s, LPs, EPs is our specialty at www.Beatles4me.com, Your #1 Beatle Source since 1977. As time permits, we update our website with new Beatles Inventory as it is received. Also don't forget, we Buy & Sell Original Beatle Collectibles, Beatle Records, Beatle Memorabilia and Beatle Autographs. Click the link above and come see our "Extensive" Beatle website, where we list our Beatle Collectibles, Records, Memorabilia, Toys, Albums, Singles, 45s, LPs, EPs!!! "You're #1 Beatle Source since 1977"
All Artwork, Concepts, Content, Design, Beatle Memorabilia & Record Photos provided on our website Copyright 2004-2019 (V190408) Beatles4me.comTM All Rights Reserved.